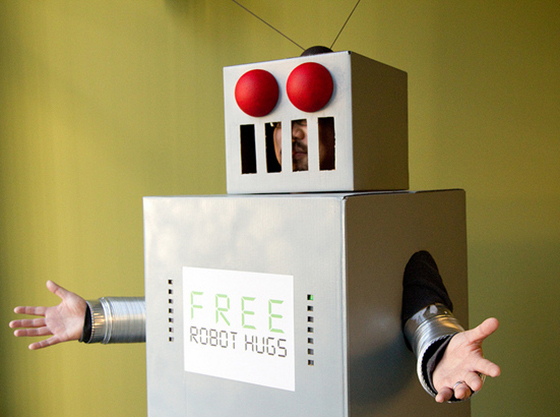 A little email marketing automation can go a long way in keeping customers happy. Image by Ben Hussman via Flickr. Marketing doesn’t end after the conversion. In fact, that’s where it begins. It costs 7x more to acquire a new customer on average than it does to keep an existing one. Customer retention is too important (and expensive) to overlook. But customer retention is more than just keeping customers. It’s about making them happy, providing a great experience and giving them a reason to spread the word about your business. To take care of your existing customers, you need a good product and awesome customer service. But you also need a plan for catering to prospects who don’t reach out. And while you can’t automate everything, you can use triggered email to identify pain points and proactively address them. That’s where behavioral marketing comes in: collecting data about user activity and personalizing your marketing efforts based on that data. Ready to put it to work? 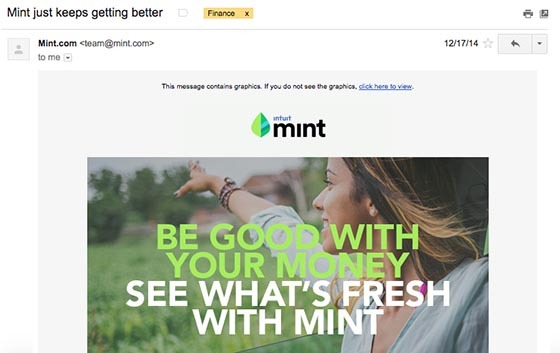 Here are four ways you can use behavioral email to better serve your users (and better retain them, too) – with examples pulled straight from my inbox. Each type of inactivity has a different cause and requires a different set of triggers to nudge customers back into action. Onboarding is all about momentum. A user has signed up for your product — their interest is piqued. It’s important to move them to the next step as soon as possible. Once you lose that momentum, it’s very difficult to get back because your service/product is no longer top-of-mind. It’s unlikely that your business delivers value in single way. Especially if your service is complex, there may be awesome features that aren’t getting the attention they deserve – or you may simply want to show off the customizability of your product. 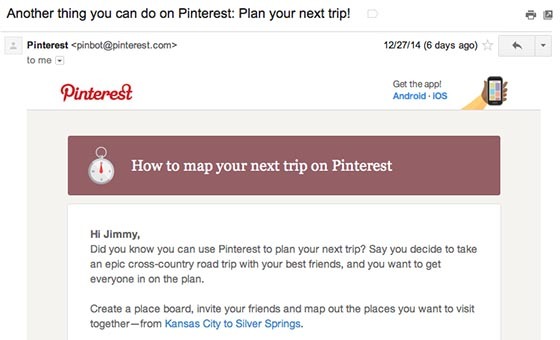 For example, Pinterest users can pin items, follow other users and create boards. 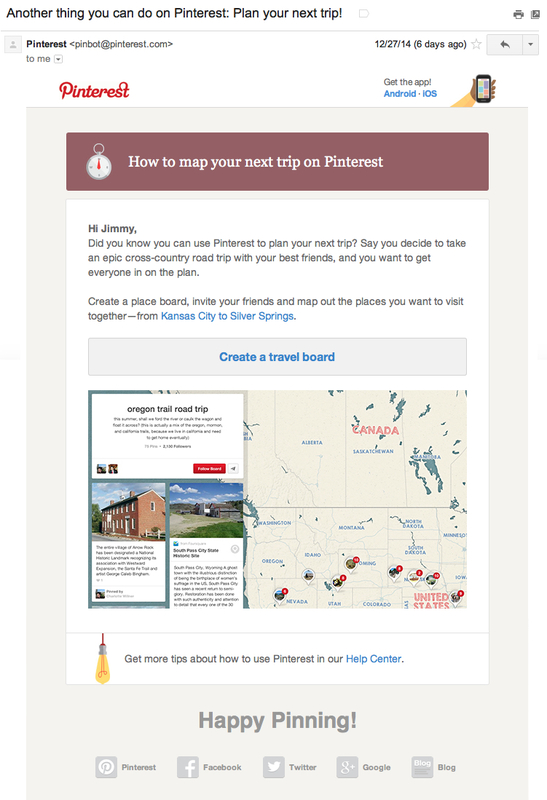 But did you know Pinterest also has location-based boards for planning travel? Neither did I until they emailed me about it. If a customer is completely inactive, you don’t have much to lose when trying to bring them back. It doesn’t hurt to spread your feathers once more and remind prospects why they initially signed up. In this example from Mint, they hold nothing back. A redesign, new features, new apps… there are a number of cool things that could draw a customer back in. 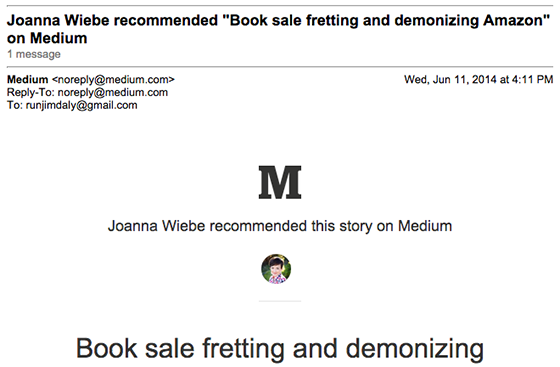 Emails should typically be highly focused — one call to action, one button and no distractions — but in this case, it’s okay to spread your net far and wide since you’re selling the entire product, not just one feature. 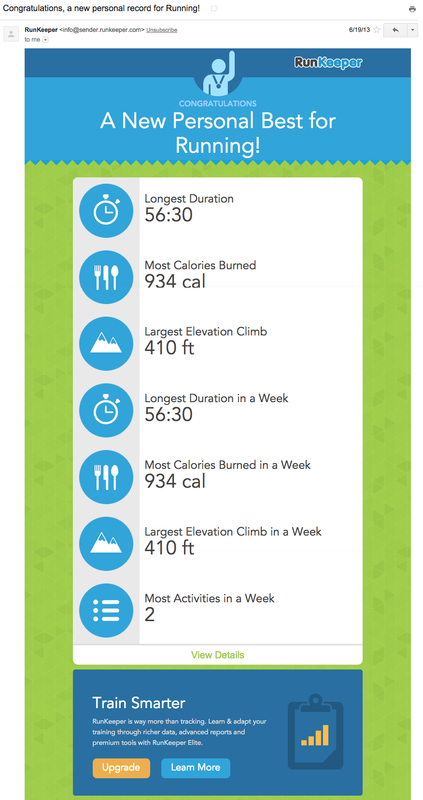 To track inactivity, you need an advanced analytics tool. KISSmetrics and MixPanel are great options and you might consider using Segment to plug the data into your email provider. Once you start collecting data, look for trends in engagement and try to replicate them. For example, try to find which actions your best customers took early in their lifecycle and drive new users the same direction. This is a totally underrated strategy for retaining customers. Transactional emails — receipts, invoices, notifications, reports, etc. — are opened at up to 8x the rate as compared to promotional emails. 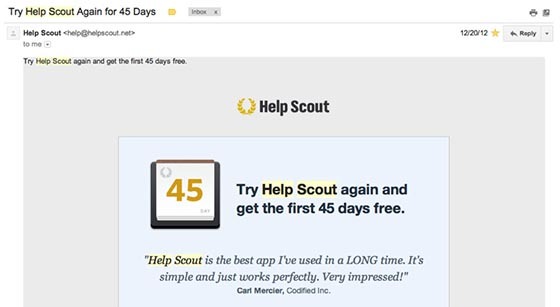 These emails aren’t usually seen as a marketing platform, but it’s free attention that few marketers take advantage of. When a customer signs up or makes a purchase on your site, they expect to receive a few transactional emails: a monthly report, maybe an invoice. If those emails aren’t carefully designed to increase engagement with your site, it’s wasted attention. Attention is hard to come by these days – don’t waste it! 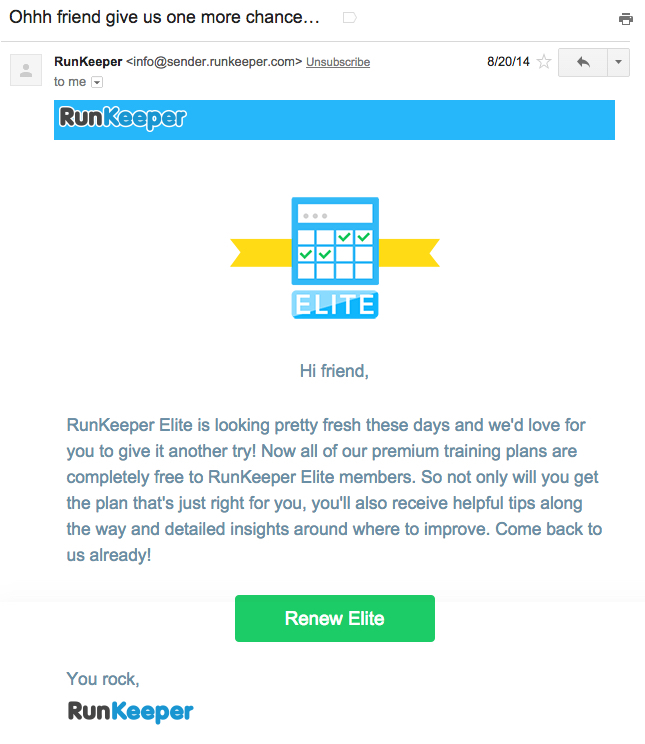 Here are a few examples of transactional emails that do a great job of encouraging the recipients to re-engage. Reports emails — account overviews and usage updates — are welcome in the inbox because users know these emails are informative, not promotional. 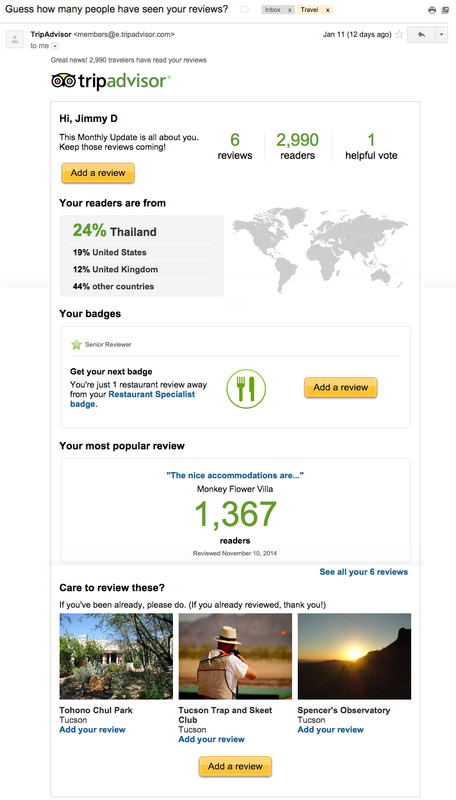 TripAdvisor sends some of the smartest report emails I’ve ever seen. 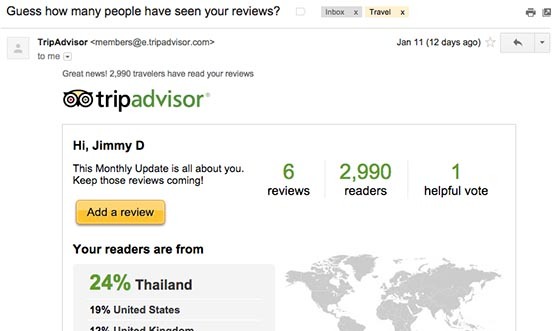 This one is a clever report that provides lots of analytics about the reviews I’ve written. It’s transactional — wink, wink — but there are three strong calls to action to re-engage with the site. We’ve all gotten plenty of notifications like this. They’re not generally perceived as marketing emails because they aren’t selling anything — or are they? 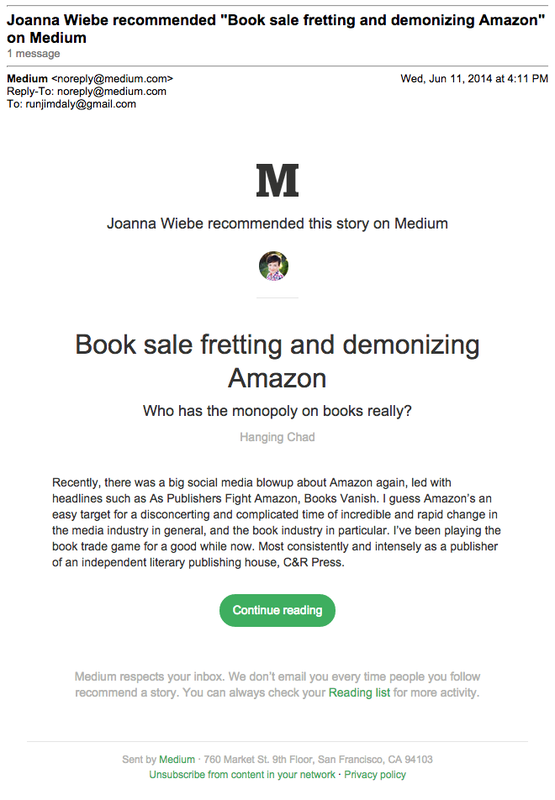 In the example below, notice how Medium uses transactional language framed with social proof. It’s highly personalized for me based on people I follow and have interacted with before – all while encouraging me to engage with the site. For many apps, accounts contain all kinds of interesting data and information that the user can’t see without logging in. 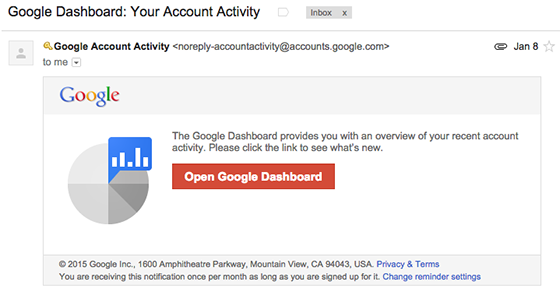 If you’ve got a great product, use email as a catalyst to get them logged in and active. Let the product sell itself. Google Apps sends a report like this every month whether you’re active or not. Once you click the button, you get an overview of all the services included in your membership, not just the ones you use regularly. Do a quick audit of your transactional emails so that you understand every possible way your customers hear from you. If you use a third party shopping cart for example, see how you can customize your receipts or use a standalone transactional email service to send your own. Most apps allow at least some customization. Focus on utility first, then offer extras like referral codes and upsells. Did you know that just 25% of free trial users actually convert to paying customers? That’s an abysmally low number considering these are people who are interested enough in your product to check it out. 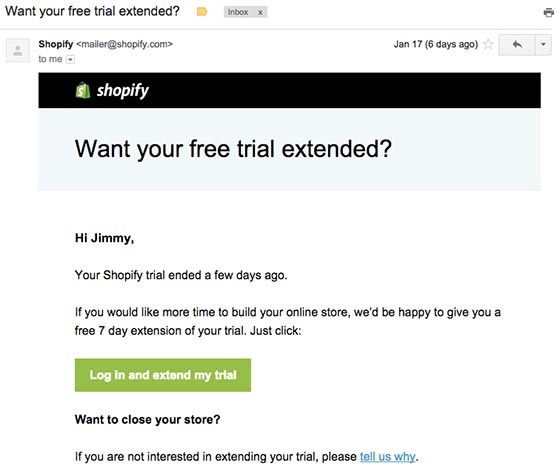 That’s where “Hail Mary” emails come in: last-ditch efforts to engage an inactive user or expiring free trial. This is how Vero became a Help Scout customer. We’ve been a customer for two years so this was a really profitable email. There were two things about this email led to the conversion. First, it reached us at just the right time. It wasn’t that we disliked the product, it was just that we didn’t have time to test it enough during the trial. The second killer element is the testimonial — it was just what we needed to hear. Shopify does the same thing. Notice how there are no distractions – just a bit of copy and a strong call to action. 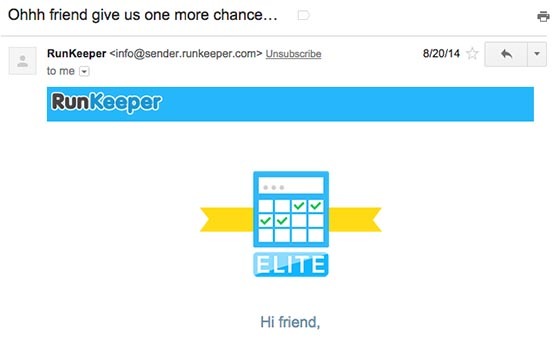 RunKeeper sends a very direct, frank email. They acknowledge the situation then do a great job selling the benefits of a paid membership. If they don’t convert and the trial ends, make them an irresistible offer. If they still don’t convert, continue to educate them about your solution. Lifecycle emails are like bumpers in a bowling alley. They keep the ball out of the gutter and improve the chance it’ll knock down a few pins. These emails are designed to spark very specific actions in the customer lifecycle — anything from completing a profile to adding team members. Encouraging engagement adds value, making it the best way to avoid inactivity in the first place. It’s the most proactive guard against churn and great way to educate your customers. 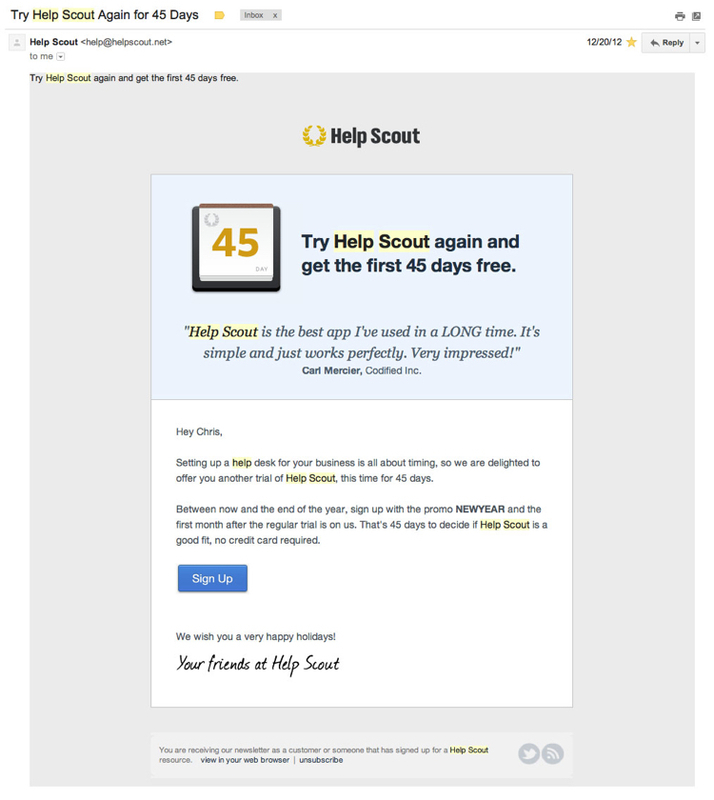 Here are just a few ideas for lifecycle emails (though you can check out 135 more examples here). Milestone emails build on momentum by creating a positive feedback loop. Desired behavior is rewarded to encourage repetition of that behavior. Some businesses take this to an extreme with gamification (badges, awards, levels, etc.) but anyone can take advantage of milestone emails by triggering an email when a user engages. 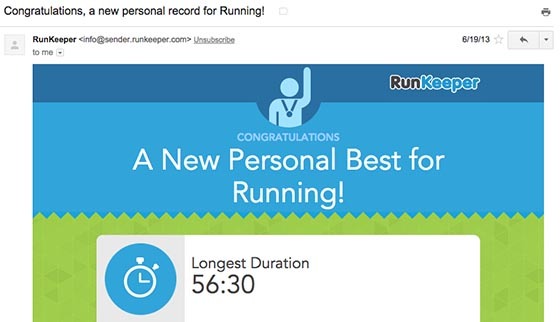 Here’s another RunKeeper email that does a great job making the recipient feel great about using their app. 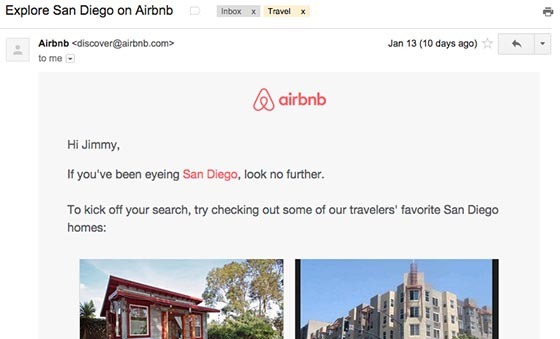 Airbnb are masters of behavioral email marketing (more on that here). They gather data as users browse their site and send targeted follow up emails. 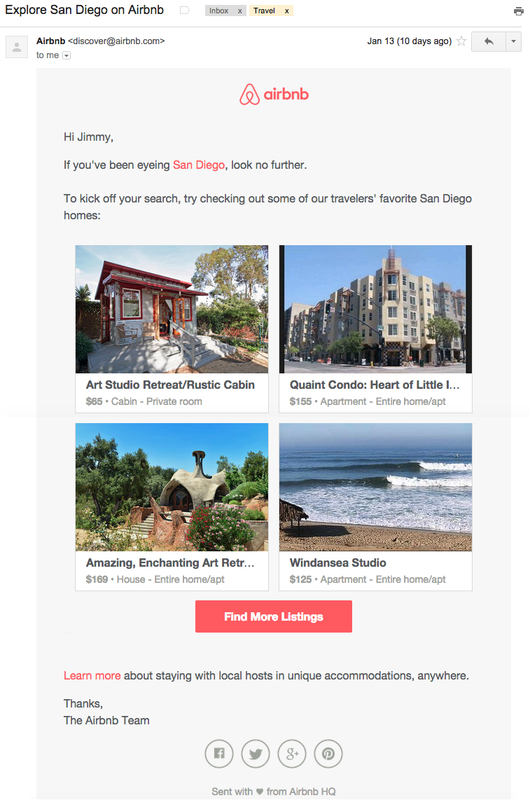 For example, if I look at listings in San Diego, I can expect a follow up email like the one below. They even take into account the price range of the listings I checked out to make sure the email is as relevant as possible. Browsing history shows intent. It’s just like browsing a retail store. You might pick up an item, see how it looks, feels and smells. And if the store is smart, a salesperson will offer to help you. This email is like that salesperson. 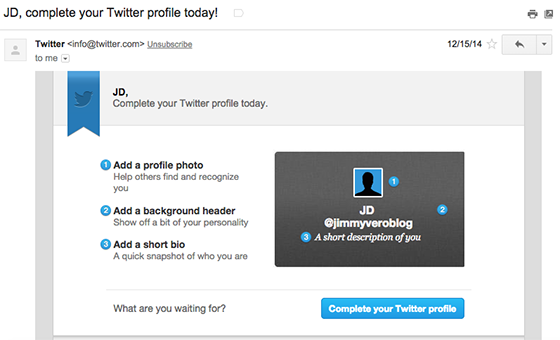 Did you know that 70% of brands don’t personalize their emails? That’s a shame since personalized subject lines have been shown to increase open rates by as much as 22%. Subject lines are just the tip of the iceberg. It’s easy to monitor behavior inside your app or site then personalize emails based on that data. Spotify, for example, keeps track of the artists I listen to then sends emails like this when the artists release new music. 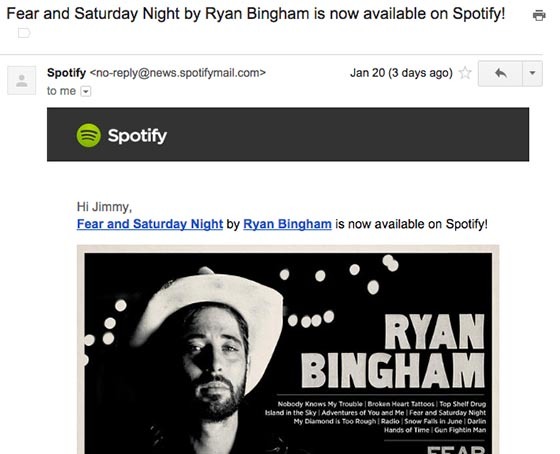 I use Spotify every day but emails like this ensure that I always have something new and exciting to check out. 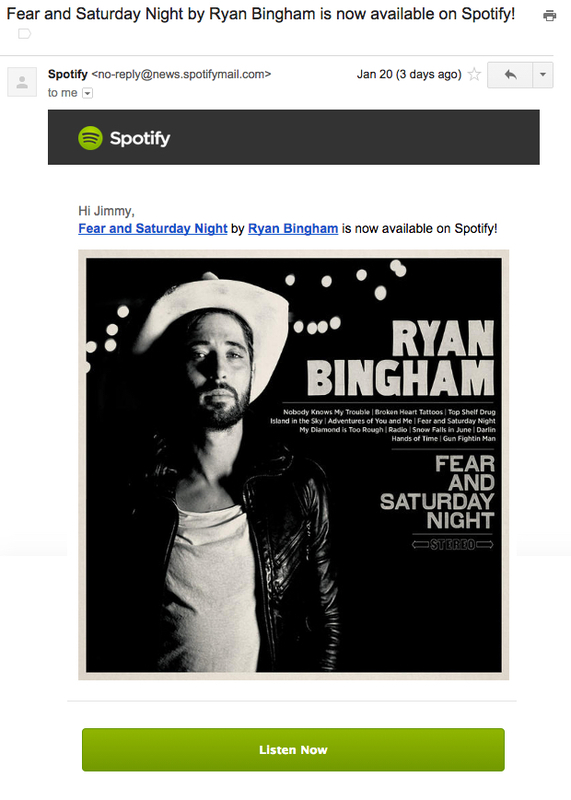 Each time I get one of these, my reliance on (and love for) Spotify grows deeper. Customer retention starts and ends with a great product. Marketing can help – but at the end of the day, if a user isn’t satisfied, they will leave. Get your product and marketing teams in the same room to talk through engagement, inactivity and retention. Hopefully the examples in this post will inspire you to take a fresh look at your customer retention process. It’s likely that behavioral and triggered email is a massive opportunity for your business. To get the ball rolling, commit to creating, testing and automating just one retention email. And don’t procrastinate – start today. How do you keep your users engaged and happy? Let us know in the comments.